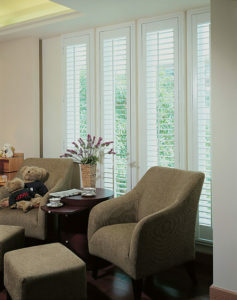 Just Shutters Holywell is part of the North Wales, Cheshire & The Wirral Division of Just Shutters. This Branch is operated by husband and wife team, Ken and Angela, who possess a vast amount of experience in customer service between them. As a result, you can rest assured that you will receive the highest service standards one would expect of the Just Shutters brand. Call the shutter experts on 01352 872058 to start your Just Shutters journey. -Shutters are completely child safe. Therefore, they are perfect for a family home! -An additional layer of insulation is added to your home when installing shutters, consequently reducing utility bills. -Shutters are made to measure and completely bespoke. Therefore, you can ensure that your home is truly unique. -The durability of shutters ensure a lengthy longevity. As a result we offer a lifetime guarantee! Not sold yet? Browse our stunning photo galleries to get inspired about the possibilities of shutters in your home! Contact the experts from Just Shutters Holywell on 01352 872058 to start your Just Shutters Journey. Whether you are booking your home design visit, our simply want some shutter related advice, the team are on hand to help!